Police in the Guadalcanal Province are calling on people residing alongside rivers, streams, creeks and coastal areas in the province to take the necessary precaution at all times following the death of man believed to have been killed by a crocodile in the Tangarare area in West Guadalcanal on 15 January 2018. 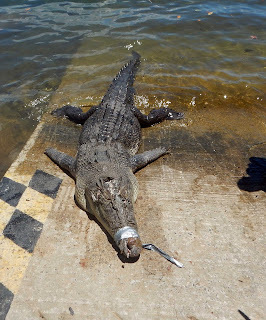 It is alleged a 20 year-old male was attacked by a crocodile at Hove River in the Tangarare area after his body was found next day (16 January) at the same river by relatives. “In the meantime, I appeal to members of the communities in the province residing alongside rivers, streams, creeks and coastal to always take precaution and look out for these dangerous reptiles at all times,” says Acting PPC Manetoga.